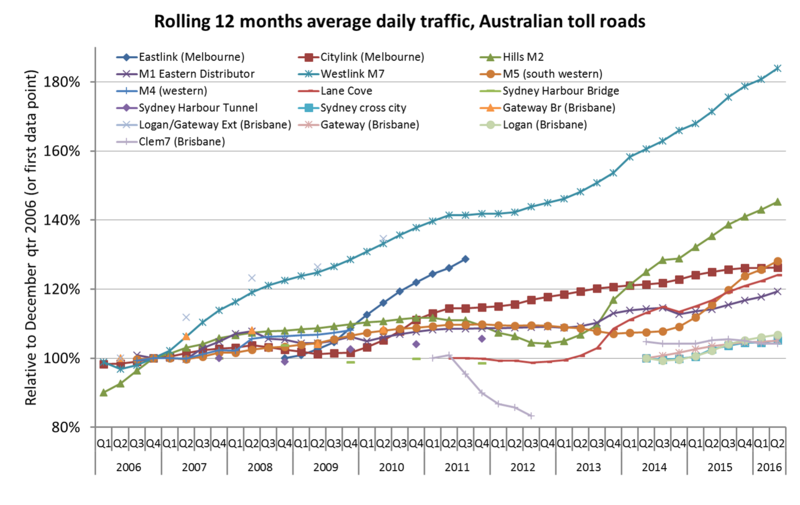 What are the trends in traffic volumes on major toll roads in Australian cities? How sensitive are motorists to toll prices? How accurate have forecasts been on some recent toll roads? This post aims to shed some light on these questions. Citylink, which is effectively made up of two mostly radial motorways in Melbourne, has by far the greatest traffic volume of any of the roads. In comparing these values, be aware that some toll roads are very short (eg just one bridge or tunnel), and others are over 20 km in length with many exit and entry points along the way. For reference, the proposed east-west link toll road between Melbourne’s Eastern Freeway and Citylink was forecast to carry 100-120 thousand vehicles per day. Most roads show a cyclical trend, with weak growth in 2008-09 (possibly GFC related) and 2012, and strong growth in 2013-14 and again in 2015. Melbourne’s Eastlink, which runs north-south in the outer Eastern suburbs. Sydney’s Westlink M7, which mostly runs north-south in the western suburbs. Brisbane’s Gateway Bridge, which provides a north-south link east of the city centre. Melbourne’s CityLink has shown a fairly steady growth trend of around 3%, except for a decline in 2009 (probably related to roadworks, but traffic soon recovered to trend once these works were complete). The road upgrade appears to possibly have had an impact on train patronage – refer another post. Traffic volumes on Sydney’s M2 declined between late 2011 and mid 2013 due to major road upgrade works, but have since rebounded quite spectacularly. 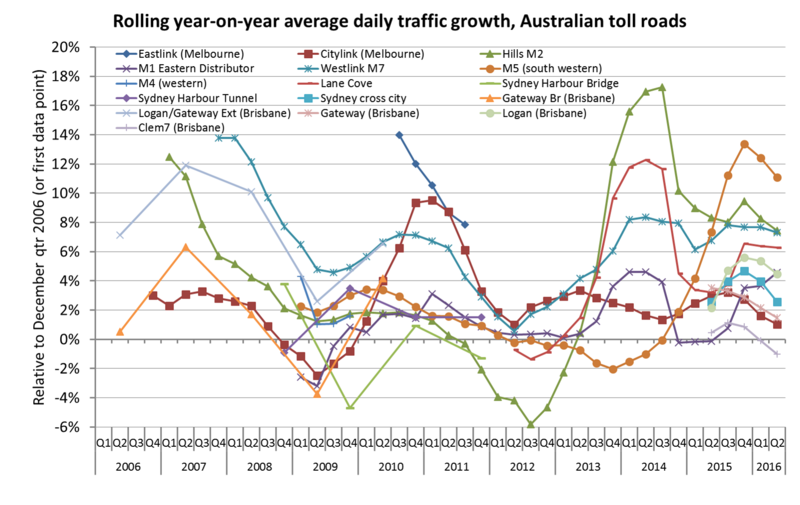 An important note on growth rate precision: Transurban report daily traffic volumes rounded to the nearest thousand. For roads with relatively small volumes (eg Clem7), the growth rates will be more impacted by rounding errors. 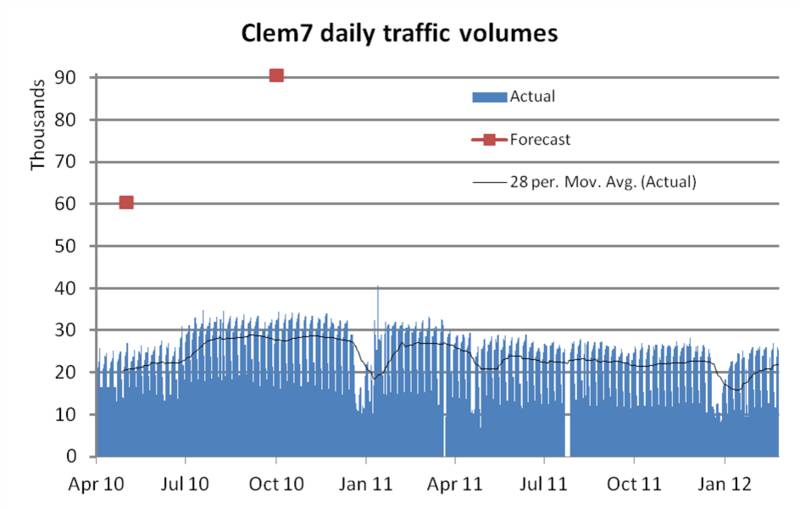 For example, the traffic volumes on Clem7 went from 27+26+27+27=107 thousand in 2014/15 to 27+26+26+27=106 thousand in 2015/16, which is notional growth of -0.9%. 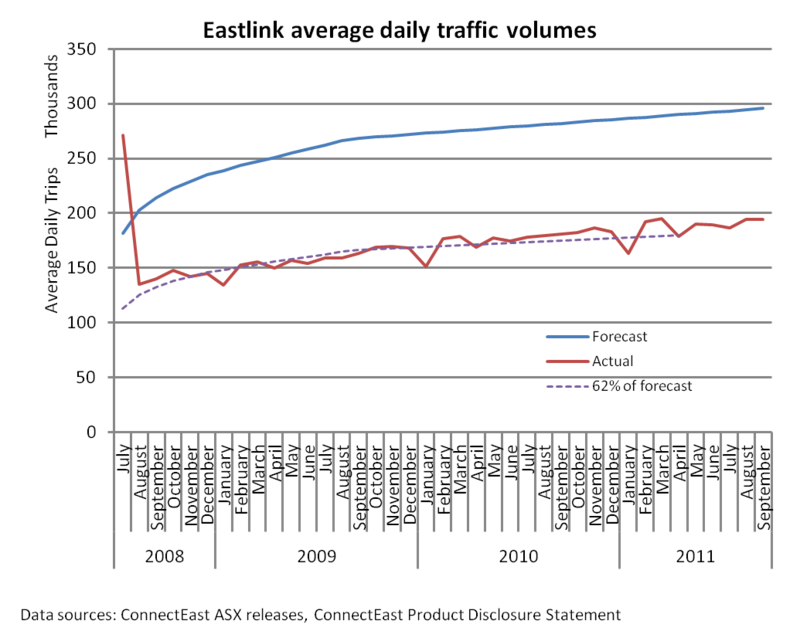 But actual values for each quarter will be within +/-500, and the rounding errors will add up over the eight quarters making up the calculation. The actual growth could be anywhere between -4.6% and 2.9%, but is more likely to be in the middle of that range. The Brisbane Gateway Bridge and Logan/Gateway Motorway extension data is only available for financial years in annual reports up until 2010. Transurban took over these roads and have reported traffic volumes since 2013 but they do not appear to be the same measures so I have listed them separately. 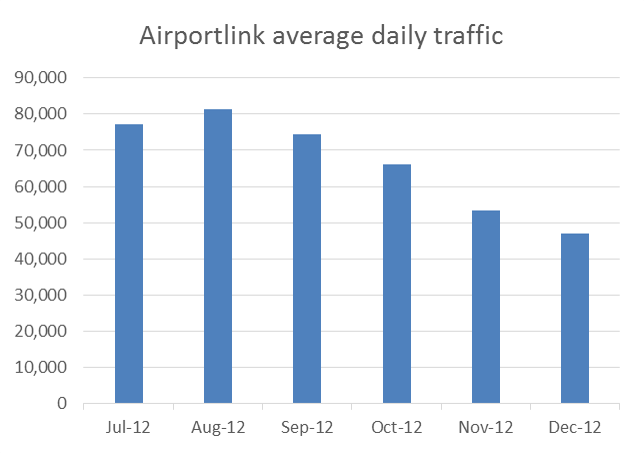 In October 2011, Horizon Roads purchased Melbourne’s Eastlink, and they do not seem to be publishing traffic volumes. I haven’t been able to source Clem7 data for 2012 and the first half of 2013. Calum Hutcheson from Hyder Consulting has generously compiled and shared time-series data with me on traffic volumes going back to 1971 for these two toll roads. He has sourced data from several available sources but has had to estimate some figures where data is missing. Traffic volumes levelled off on the bridge around 1988 and on the combined bridge and tunnel around 2005. 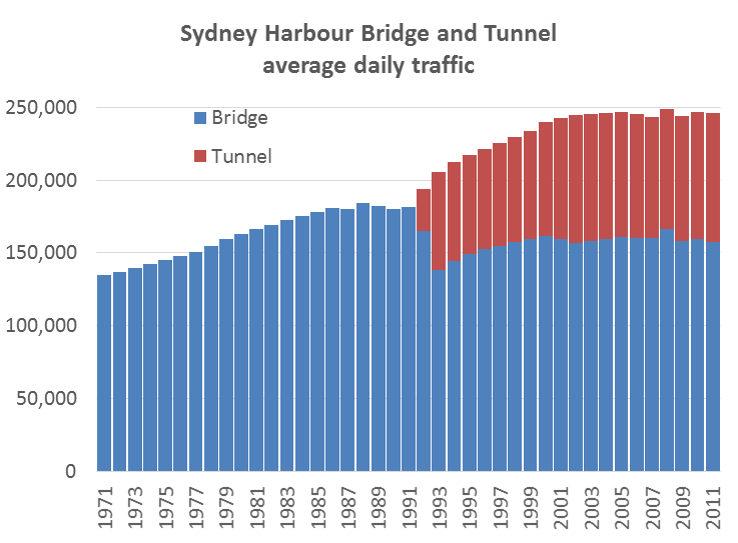 It would appear the tunnel brought additional vehicle capacity good for around 17 years’ growth but that has now been exhausted (although I’m far from an expert in Sydney traffic). In 1992 one lane was converted to a southbound bus lane (presumably related to the capacity freed up by the tunnel). The bridge’s vehicular traffic levels have not returned to 1988 levels, but I suspect the number of people moved in (road-based) vehicles has increased significantly (not to mention the train line across the bridge). Transurban now own this asset and reported an average 33,057 daily transactions in the June quarter of 2014 – which is below the figure for late 2006. I have not been able to source much data pre-2013, but a 2006 NSW Auditor General’s report contains some traffic volume data for 2005 and 2006, reproduced here (from page 32 of the report). The tunnel is now carrying around 39,000 daily trips – not a large increase since 2006. It would appear that motorists are highly sensitive to toll pricing, and the forecast volumes were not achieved even when tolls were removed. You can see an up-tick from the beginning of July 2010, when toll prices were cut. Tolls were raised in November 2010 and again in April 2011 and you can see corresponding drops in traffic volumes. Average daily traffic in calendar 2011 was 10% lower than for the first 12 months of operation (includes one overlapping quarter). During the 2011 flood crisis tolls were waived for one week, and at the end of that period on Monday 17 January 2011, 40,566 vehicles were recorded, the highest since tolling commenced. This may or may not have also reflected closures to other roads making Clem7 more attractive. (footnote: actual weekend volumes have not been published for April 2010, so I have substituted the average non-workday figures, that have been published). More recently, this road is carrying an average of 26,000 vehicles per day, around a quarter of the forecast. This toll road was forecast to attract 135,000 vehicles per day one month into operations, and have 165,000 vehicles per day after the ramp up period. The traffic volumes declined as tolls were progressively introduced to all traffic. BrisConnections, the owner of the road, went into voluntary administration in February 2013. The Clem7 and Airportlink roads are the first two major tollways as part of the TransApex plan for adding major road capacity to Brisbane. The third piece of this puzzle is the Go Between Bridge, now owned by Transurban and they report 12,000 vehicles per day as of late 2015 (see some data on the Wikipedia page for what it’s worth). The forecast was for 17,500 by 2011 and 21,000 by 2021. Current patronage is around two-thirds of that forecast. I’m guessing it may be a very long time before these TransApex roads reach capacity. According to Wikipedia, this covers all major toll roads in Australia in operation at the time of writing. I’ll try to update these figures periodically. 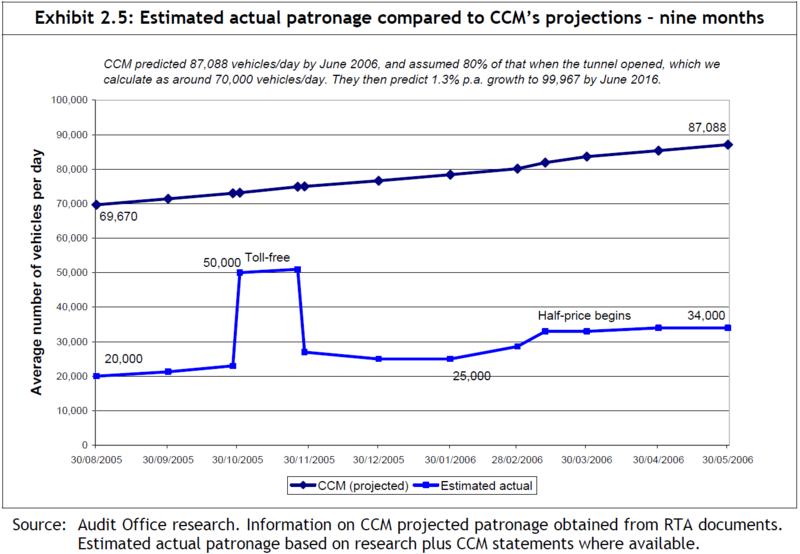 The following chart shows that Eastlink actual traffic volumes have been fairly consistently around 60-65% of original (2004) forecast since tolling began. It suggests the forecasts were good at estimating the ramp-up shape, but not so much the overall traffic volumes. Note: ConnectEast issued revised forecasts in August 2009, including that (steady state annual) average daily trips in 2011 would be 209,900. That forecast doesn’t appear to have been realised either. Unfortunately data reporting stopped in October 2011 following the sale to Horizon Roads. Maps and more information about many of the roads is also available on the Transurban website. See another post on Melbourne traffic volumes. Some interesting recent data on Brisbane traffic volumes is in this report prepared for RiverCity Motorways (who operated the Clem7). It shows many major roads in Brisbane with stable or declining traffic volumes (possibly because they are at capacity, or possibly because of a mode shift to public transport). This entry was posted on Saturday, March 3rd, 2012 at 11:00 pm and is filed under Australian Cities, Brisbane, Melbourne, Road Traffic, Sydney. You can follow any responses to this entry through the RSS 2.0 feed. You can leave a response, or trackback from your own site. What a good presentation. Its good to know the facts on our major roads. Great presentation Chris. It would be interesting to know what additional capacity is ‘purchased’ on toll-roads through the inclusion of bus lanes (such as on Sydney’s M2 and Harbour Bridge). I’m certain it could be significant, particularly if the number of people (rather than vehicles) could be worked out. 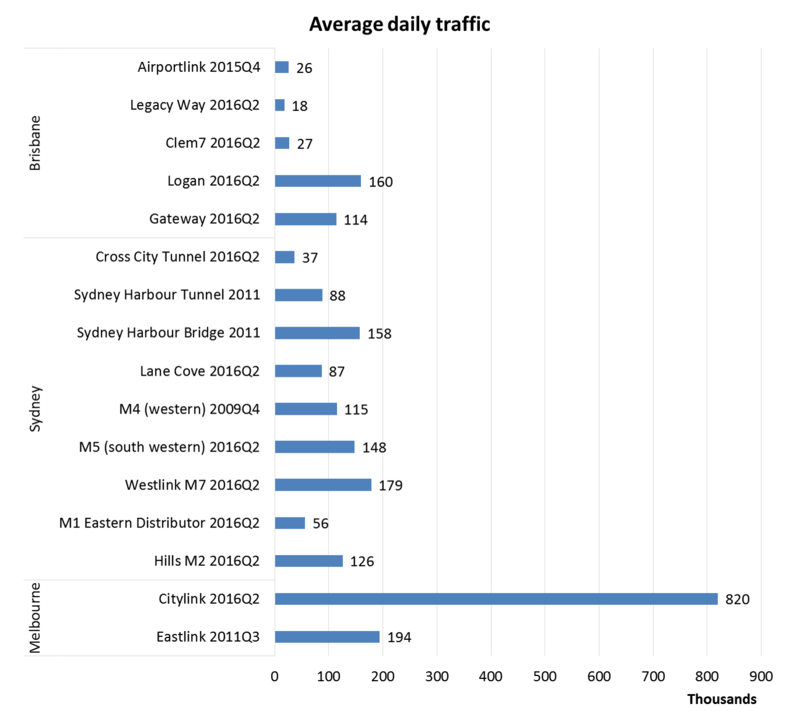 I’m rather puzzled as to how Citylink manages to carry over five times as many vehicles as the Sydney Harbour Bridge. Is a section by section breakdown of the traffic volumes available anywhere? Hi Aidan, obviously the fact Citylink is made up of two reasonably long motorways (plus a city access road) means not all of those daily trips are going past one point. Many trips will cover only a subsection of the road. I’m not aware of any section by section data for Citylink, but sectional data for public roads is available on the VicRoads website, and Citylink average peak period speeds and freight volumes are in the Traffic Monitor reports. This is a very good resource! A terrific resource for researchers which saves many hours of extracting data for projects from source documents. Well done.